Many people talk about the “Selvaggio Blu” ( “The Wild Blue trek”) as the toughest and most challenging hiking trip in Italy. I would say it’s the most amazing outdoor week you can experience all around Europe. More, the best backpacking adventure in one of the most beautiful and wildest corner in Italy (and not only). The Wild Blu Trek goes for 50 km along the east side of Sardinia, in the region called Ogliastra, and follow the jagged coast line between the two villages of Santa Maria Navarrese and Cala Gonone. To get more into it, let me tell you the first important thing. 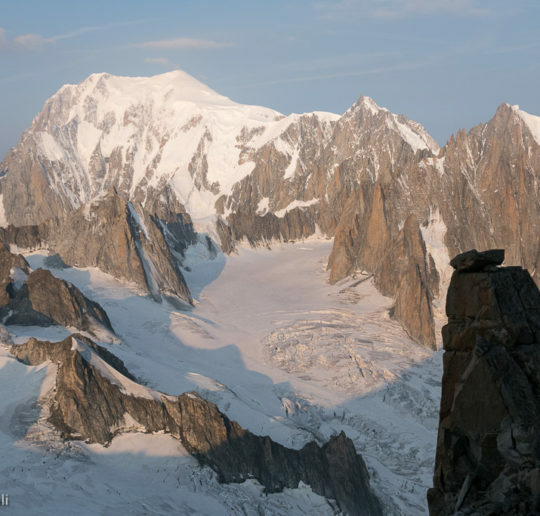 The Wild Blue trek is not the classic multi day hiking trip you can find in the Alps, where trails are well marked and route finding is very much straight forward. You will find old mule tracks opened back in the early 20th Century by lots of Italian workers who came to Sardinia in order to exploit the forests to produce charcoal out of oak trees, to send it back to Italy and use it for house heating. 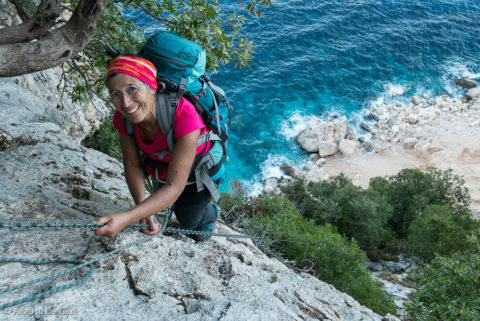 More, you will follow the Sardinian shepherds tracks that they first opened to chase their goats in a rugged and rocky environment right above the sea level. It would be better to call the sheperds Alpinists, as they really had to climb some steep rock walls in between those hanging trees terraces, without using any ropes (the first followers then rated those pitches up to grade IV) and in some chances they built some amazing wooden ladders with juniper logs (“iscala ‘e fustes” is the sardinian name for these ladders), placing them on these unclimbable rock walls to help themselves to move from those hanging terraces to the others. So these mule tracks, sheperd trails, wooden ladders, steep rock pitches (some of them are nowadays equipped with a steel cable, others need to be equipped by the mountain guide using a rope), some goats tracks (yes!and they are narrow and pretty exposed in some spots), together with some sections where there no other way to get through if not abseiling with a rope, all of these feature the “Selvaggio Blu” trail. What they call “Ledere” in Sardinia. A steep scree mixed with grass that makes the climb tough and sometimes strenuous. Nowadays you can find lots of information about the Wild Blue trek, there are GPS tracks online and detailed descriptions of each stage, but the right way to go is still not always obvious, GPS devices don’t work well when you are walking very close to steep rock faces, plus dealing with the technical sections involving some ropework it requires a solid experience. Two other things make the Wild Blue trek so unique and challenging. There are no huts along the route, you need to bivy under the stars with your sleeping bag and pad only. 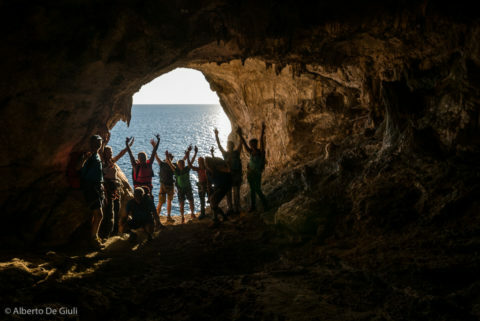 In case of rain (although this option is very rare) there are many caves where to hide to stay dry. Last but not least, there’s no way to get food and water along the way, you must organize in advance all the supplies for each day, so you will find all you need right at the overnight spot. Food and water come by boat every afternoon. The Wild Blue Trek. The Wild Blue trek takes 5 days of hike, and to get as close to the sea as we can, on the third day we will tackle a more challenging route between Cala Goloritzé and Cala Mariolu, opened in 2014 by Marcello Cominetti and friends, where a very exposed narrow track plus a short but steep via ferrata allow you to go across some hanging woods right above the coastline and up to beautiful rocky spur. Hiking the Wild Blue Trek. Are you wondering if you are up to the Wild Blue Trek? Well, you’re required to have sure-footednees, a solid hiking background and a pretty good fitness level (there’s an average of 6 h/day of hiking, with a 10kg backpack, on a good pace, not fast – remember, it’s a holiday!) and absolutely no fear of heights. Last but not least, you need to be flexible and adaptable, getting ready to move as a wildboar in a wild settings (if you don’t have this skill yet, no worries you will get it!). 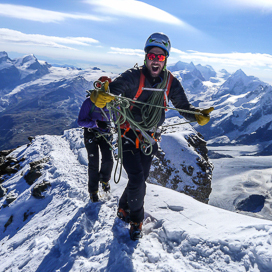 Your mountain guide will take care of the technical sections, you will take a great advantage of a rope set up in the right way and in the right spot, so it is not required any mountaineering background nor any rope experiences with harness and carabiners. I’m also available to guide any private group (min. 6 max. 9 ppl) on spring time (from April to late May) and autumn (from September to early November). What’s included: professional IFMGA/UIGAM mountain guide service for the 5 hiking days, “Selvaggio blu” tax, 2 nights in hotel *** with half board (double and triple rooms, single room with extra charge on request), all lunches and dinners on the hiking days, water supply during the trek, boat service to get back to Santa Maria Navarrese at the end of trek, technical equipment if needed (harness, sling and carabiner). What’s not included: airfare from and to Sardinia, transfers from and to Santa Maria Navarrese, everything that is not mentioned on “What’s included”. Day 1: The meeting point is set for 6pm at the Albergo Santa Maria in Santa Maria Navarrese. Trip briefing and gear check before dinner. Day 2: we set off right from the hotel and we start hiking across a nice trail in the trees, above the sea. It takes less than 2h to get in front of Pedra Longa, a 150m rock spire right above the water, which also marks the official start of the Wild Blue Trek. Just a litlle bit further on we can already have a break for a swim at the Forrola beach before start climbing up the first switchbacks that lead to Cengia Giradili, a pretty wide ledge that splits Punta Giradili in half. Giradili is a beautiful peak famous for its steep multi pitch climbs on its south / south west face. Hiking further up we reach the beautiful Ovile Us Piggius, a tipical sheepfold recently restored, and then we keep walking on a dirt road to reach our overnight spot, the comfortable Ginnirco sheepfold. 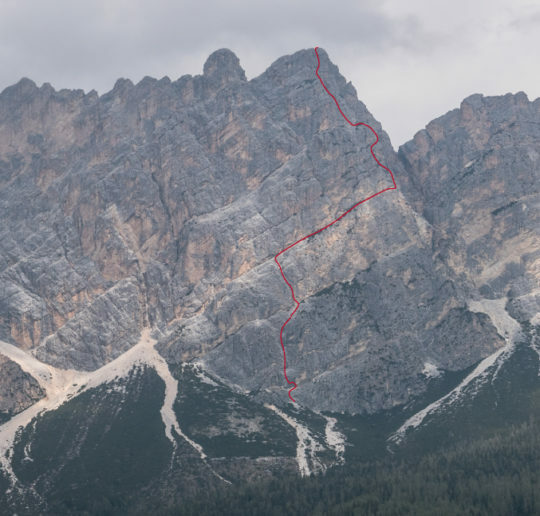 It’s possible to make the first day more challenging if you climb the Sos Oggiastros route to the top of the ridge of Punta Giradili. 5h hike, 12km, +800m vertical gain. The Pedra Longa. The Wild Blue Trek, day 2. Day 3: it’s the longest and most strenuous stage of our Wild Blue trek. We leave the sheepfold at the first lights and we hike across some challenging rocky fields where the rocky ground is shaped like sharp knives, then we roll down a beautiful oak and strawberry trees and further on a more rocky terrain where we find the first technical section of the Wild Blue, on Bacu Tenadili (bacu stands for narrow valley in the local language), where we put the harness on and we will use rope and carabiners to climb across a steep rock band. The trail now gets easier and we reach the beautiful fjord of Porto Pedroso (4h from Ginnirco sheepfold), where we have a refreshing swim and a pic nic lunch. The next part of the hike goes on a easier terrain, but it’s still pretty long, with more dramatic views towards the steep cliffs above the blue sea water, and we will get to Punta Salinas, the best viewpoint on the Guglia di Goloritzé, probably the most famous rock spire all over Sardinia. 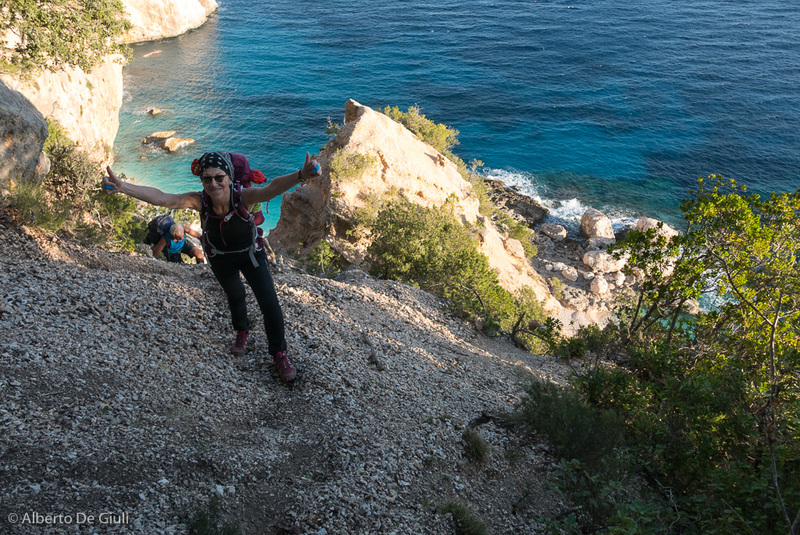 We have still 1 hour to go downhill to reach Cala Goloritzé, a beautiful beach (which is also a UNESCO heritage site since 1996) where food and a well-deserved beer are waiting for us. These first two stages, depending on the season, weather and conditions, can be modified last minute, so to make them shorter/ different. 9h hike, 17km hike, +800m -1100m vertical gain. The technical section on Bacu Tenadili. The Wild Blue Trek, day 3. Day 4: today we get into the core of the whole adventure, as we climb the challenging “Su Ledere ‘e Goloritzé” route. 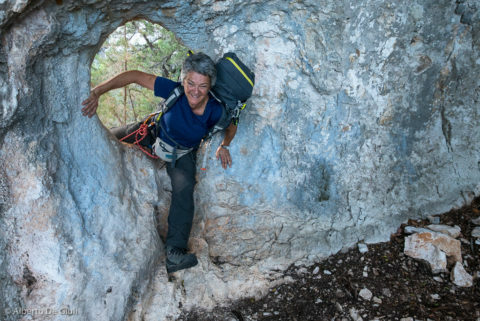 We set off right from the beach up to a steep scree and climb what I call the “wake-up rope” set up by the guide on a white rock slab above the beach of Goloritzé, and we reach a hanging trees spot called “The Springs”. 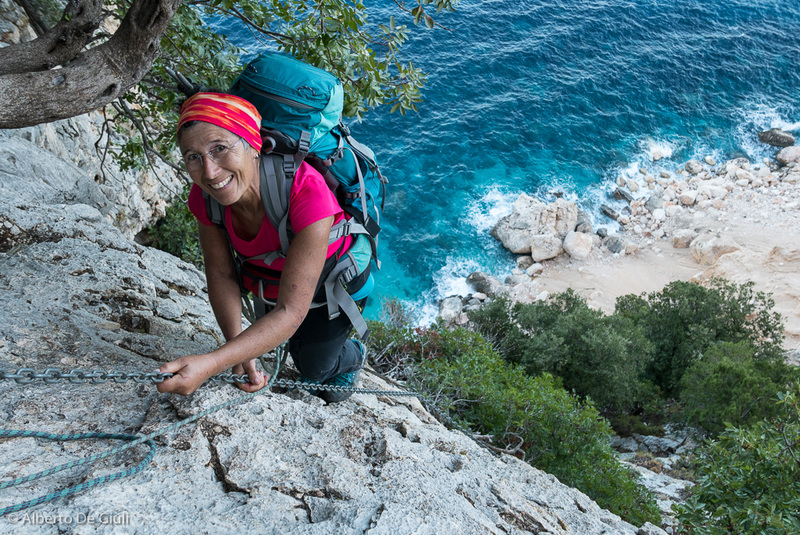 We need to go across 3 steep and exposed landslides, partly with the help of some fixed ropes, and finally we reach a spectacular golden cave 100m above the sea and the rocky spur that divides Goloritzé from the forest of Ispuligi. 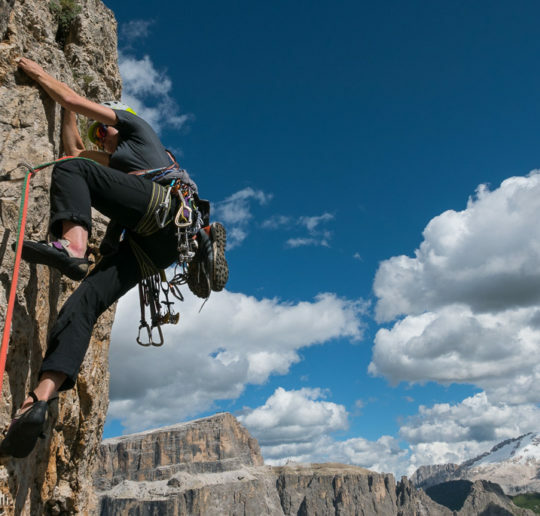 Here we get ready with our carabiner and we climb the via ferrata (just 30 meter of fixed steel cable) set up by Cominetti and friends in the 2014. 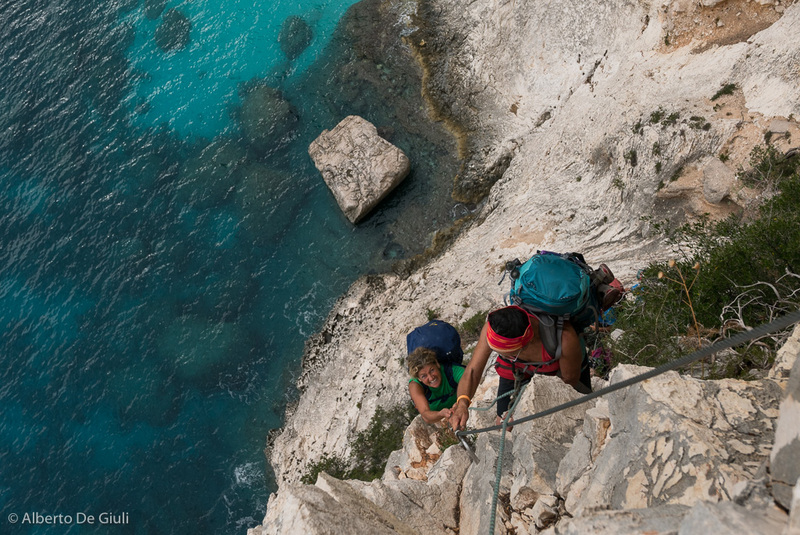 After this steep and challenging step, it’s time to take a breath and follow a comfortable traverse on a pretty wide trail (one of those opened by the charcoal workers) and we finally get to the beautiful Cala Mariolu, probably the most beautiful beach along the Ogliastra coast. This is the shortest stage of our Wild Blue trek, but it must be taken with great caution as we go across a bunch of “no fall” zones. 5h, 6km hike, +300m -300m vertical gain. 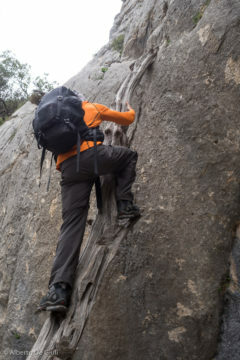 Climbing the via ferrata Goloritzé. The Wild Blue Trek, day 4. Day 5: another steep start of the day from the beach of Cala Mariolu up to a rugged couloir (100m uphill), where a rope set up once again by the guide will be very helpful. This couloir is called Su Acchissolu ‘as Crabas in the local language, it’s the “path” followed by the goats when they want to get down to the beach to cool off. We hike further up, crossing along a very narrow track that takes us on a wider and safer terrain before reaching the original Wild Blue Trek route. Some switchbacks downhill and it’s time to set up the first abseil of the trip, the first one of the four scheduled for today. Going through some amazing caves above the sea we reach Bacu Mudaloru right in time for a break and pic nic lunch. After the rest, we keep going up across a wild vegetation, caves, exposed and amazing spots, even through small holes in the rock. With one last incredible abseil with the rope, we will get to the “Grotta del Fico”, an amazing cave 20m above sea level where seals used to live and give birth to their babies. In the afternoon we have the chance of visiting the cave, I don’t want to tell you more not spoil it. This is also the spot where we spend our last night in the wilderness. 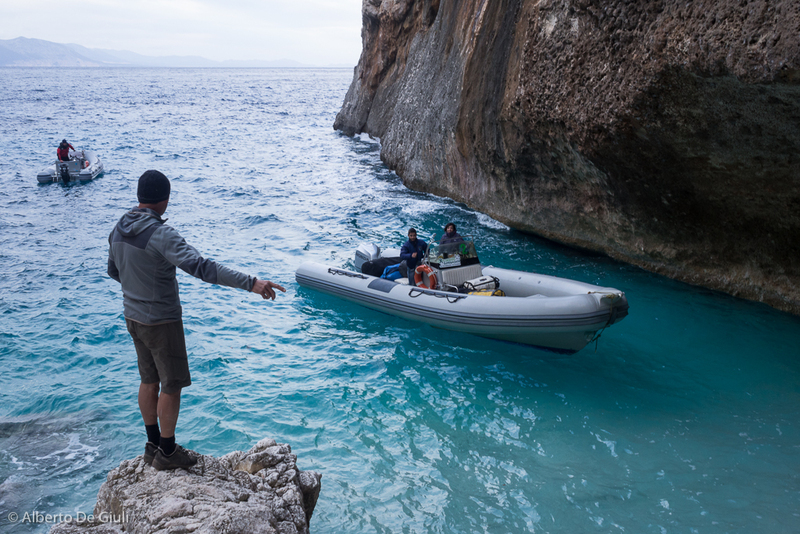 Fabio almost ready for landing down the Grotta del Fico. The Wild Blue Trek, Day 5. Day 6: the Grand Finale! Today we start going across the rocks few meters above sea level, fully exposed, through some mysterious spots (no joke!). We join once again the original Blue Wild Trek while hiking up the Bacu Su Feilau and we will reach the comfortable mule track that comes from the location and sheepfold of Ololbizzi. A very nice panoramic hike takes us to Ovile Piddi fold. 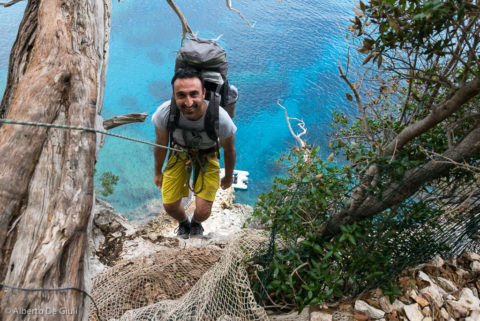 The fun begins now, as we walk across the amazing Sa Nurca gorge, and soon afterwards it’s time to set up 2 long abseils with the rope that take us directly to the woods above the beach of Cala Biriala. Here a long relaxing stroll through the forest of Oronnoro and then Plummare doesn’t have to let us think it’s all over. There is still a good way to go, across the landlisde under Plummare peak, followed by a climb of two rock slabs equipped with a steel chain. A quick break to catch our breath and we set up another 30 meter abseil with the rope, then another walk in the forest before reaching the last 20 meter abseil that signs the end of the difficulties of the Wild Blue Trek. We’re almost at end of our adventure, the beach of Cala Sisine is ten minutes far. Once at the beach we can enjoy last swim, and we might leave some food from the pic nic lunch to a family of wild pigs that often hang out around here. The trip back to Santa Maria Navarrese takes about 45 minutes by boat, and it will be the opportunity to enjoy the view of our trip from a different angle, but you might already dream that shower that you have been missing in these last 5 days! 6-7h hike, 14km hike, +500m – 500m vertical gain. Dinner and overnight at the hotel. Loredana climbing up the steel chains. The Wild Blue Trek, day 6. Day 7: breakfast at the hotel and departures to the airport. Comfortable hiking/approach shoes with Vibram Sole, better if low ankle. You don’t need proper mountain boots (sandals or flip flops for the night are not compulsory). 3 t-shirts, white couloir or bright is fine. No need to bring your own water flasks! 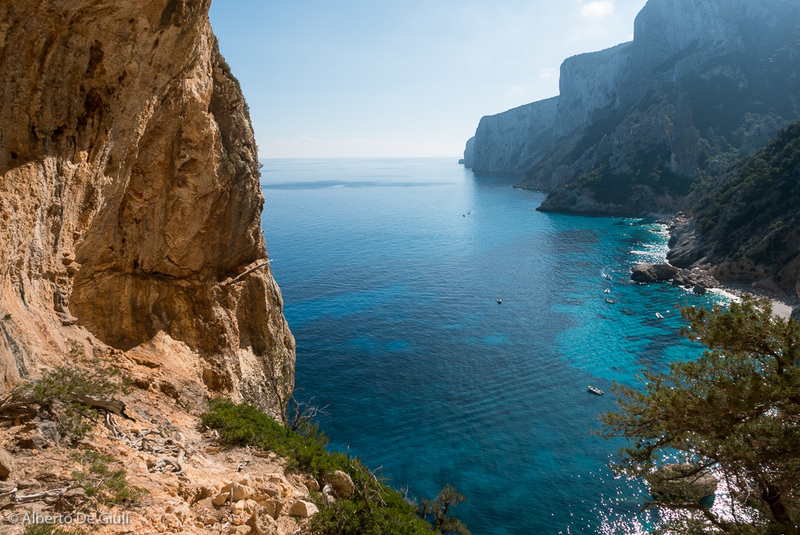 If you’re flying from an European country, RyanAir and other low cost air lines fly to Sardinia to Olbia and Cagliari airports. 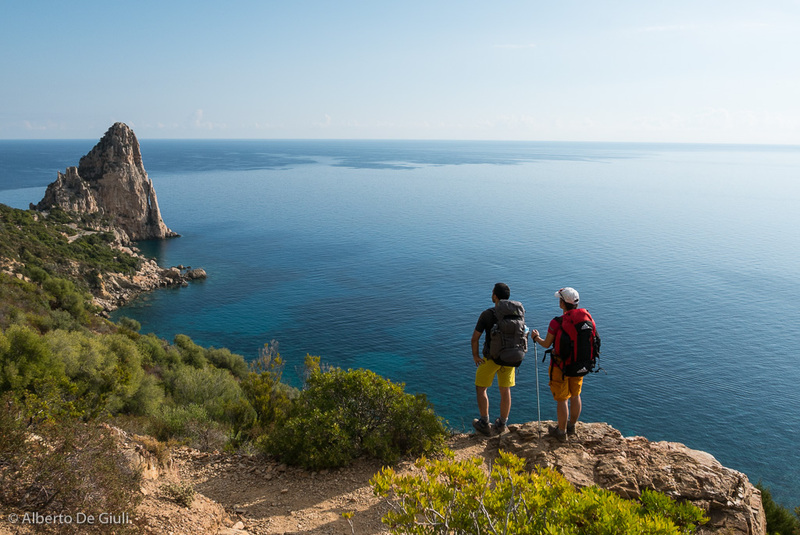 If you land in Cagliari Airport, you can get to Santa Maria Navarrese by bus (4 hours), by taxi (about 220 euros per car), or by renting a car for the day with Europcar (contact Tortolì’s office directly at +390782620090 to book the car in advance). Normally it takes 2-2.30h from Cagliari Airport to get to Santa Maria. In any case I will be happy to help you sort it out.